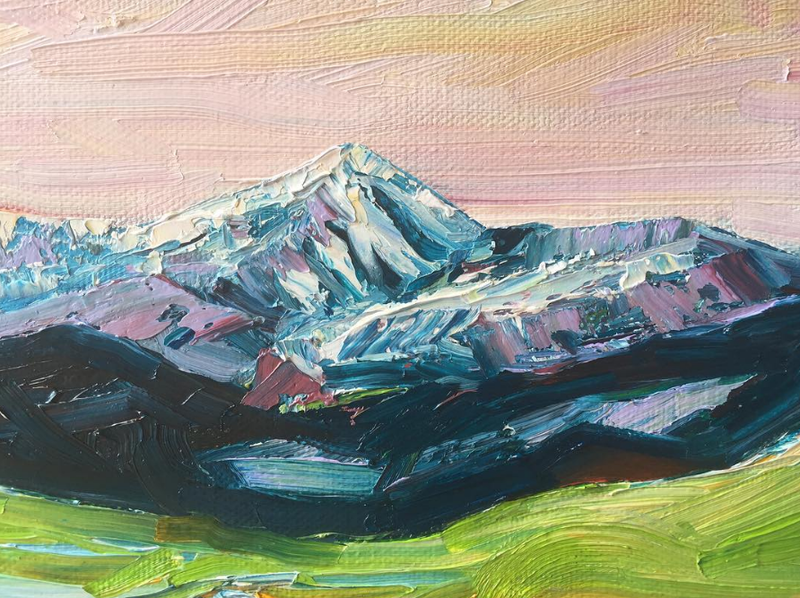 Think of the mountains of Colorado and the first mountains that come to mind might involve ski areas - you might think of the Maroon Bells, or Pike's Peak. If you've only ever passed through Denver International Airport on a layover, you'll probably see Pikes Peak shirts. Mt. 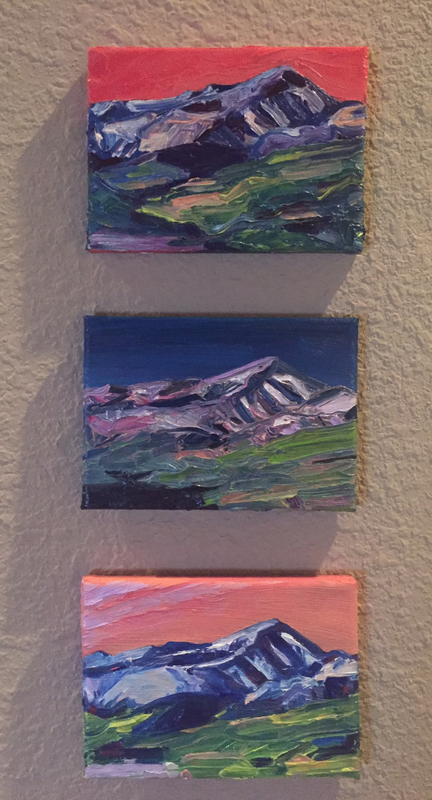 Elbert is the tallest mountain in Colorado and not an easy mountain to paint. It probably won't be on airport T-shirts or shot glasses anytime soon. The patterns of snow that fall on it's north face are nearly ever-changing, and the crater-like dish on its south face proves to be a painting challenge. Like a model with a beautiful face, but you can't say quite why it is so beautiful, Elbert is not as photogenic as the Maroon Bells and not as strikingly contrastive as Pikes Peak. It is like painting something that moves, like a dancer or a horse, only its patterns change often. It is full of surprises, and that is why I think I keep painting it - each time I try to paint Mt. Elbert, I find something new, some fleeting nuance that I didn't see before. Hiking up Mt. Elbert is usually classified as a good hike for a beginner who wants to climb a 14er. It's a peak that will make climbers feel accomplished, but it's not necessarily the most macho climb of the state. There are easier mountains to climb than Elbert, but all things considered, it is no Longs Peak. I've painted Mt. 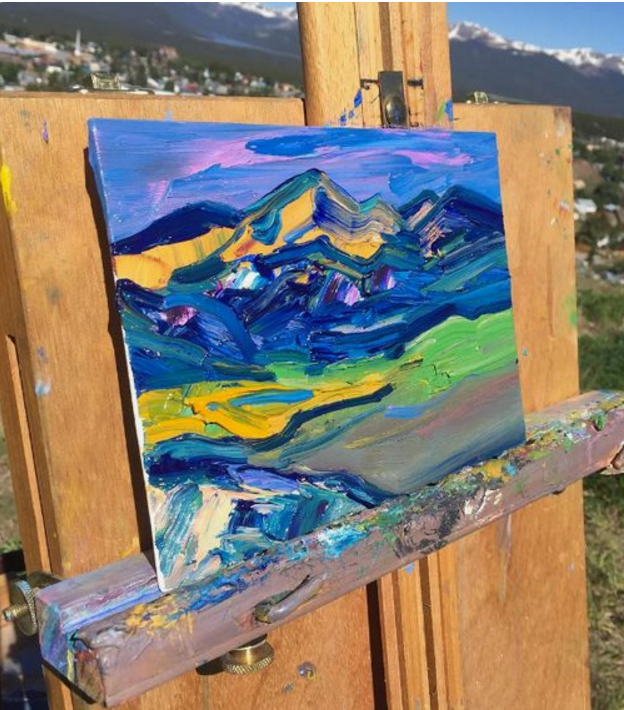 Elbert a couple times en plein air. 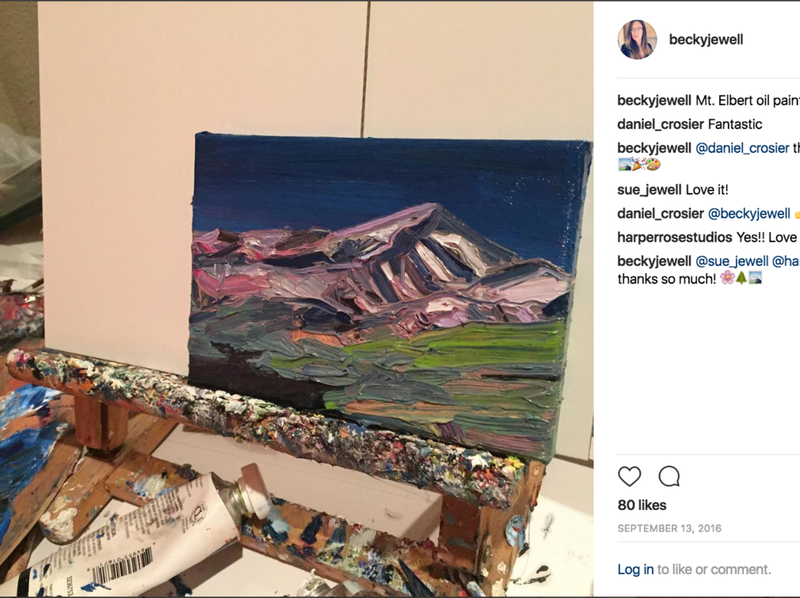 After painting about 10 renditions of Elbert in my Houston Studio, I can say it is so much better to paint from life than a photo - all of the size of the mountain and its real dimensions suddenly come forward. I like to paint Elbert with it's north and south face showing, with the south face on the left side of the canvas. If you drive to the southern side of Elbert, suddenly it looks even weirder - it is just a tall mountain with a 'crater' on it, more nothing than something. When hiking Elbert, the glacial crater dish creates a mean false summit. Elbert also has the strange task of competing with Mount Massive, its neighbor at 14,429 feet, and nearly its match in size. The two mountains are so close in height that if you pile enough rocks on top of Mount Massive, Massive is taller than Elbert (14,449 feet.) As tectonic shifts may happen, Massive may indeed one day outpace Elbert as the tallest in Colorado. Enter your email to subscribe to more art updates!